Spikor Strikes is a 1984 Masters of the Universe mini-comic; no author or artist is credited. Here, Prince Adam gets sent on a diplomatic errand, Skeletor kidnaps Teela (by this point, it seems like maybe they have some kind of weekly arrangement worked out), and Spikor, Sy-Klone, and Spydor get introduced. The plot is really a mess, and it’s no wonder an author isn’t credited. If Spikor is looking for He-Man, why is he tearing up a random tiny village? 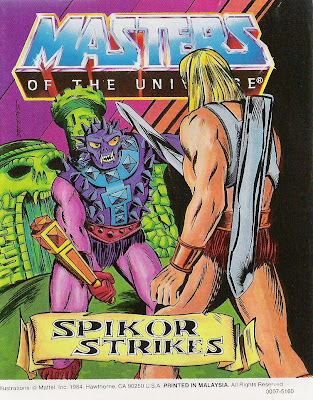 Skeletor sends Spikor “as a diversion,” yet Skeletor successfully carries out his plan before Spikor even shows up (he turns out not to have much of a trap in place, either). At the end, the heroes celebrate the merits of teamwork, even though they won the day by splitting up and not actually ever working together on anything. In other news, the art is pretty decent. But this comic is feeble.